The upper gastrointestinal (GI) series uses x-rays to diagnose problems in the esophagus, stomach, and duodenum (first part of the small intestine). It may also be used to examine the small intestine. The upper GI series can show a blockage, abnormal growth, ulcer, or a problem with the way an organ is working. During the procedure, you will drink barium, a thick, white, milkshake-like liquid. Barium coats the inside lining of the esophagus, stomach, and duodenum and makes them show up more clearly on x-rays. The radiologist can also see ulcers, scar tissue, abnormal growths, hernias, or areas where something is blocking the normal path of food through the digestive system. Using a machine called a fluoroscope, the radiologist is also able to watch your digestive system work as the barium moves through it. 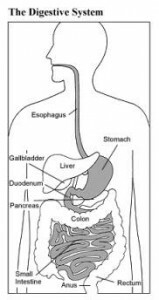 This part of the procedure shows any problems in how the digestive system functions, for example, whether the muscles that control swallowing are working properly. As the barium moves into the small intestine, the radiologist can take x-rays of it as well. An upper GI series takes 1 to 2 hours. It is not uncomfortable. The barium may cause constipation and white-colored stool for a few days after the procedure. Your stomach and small intestine must be empty for the procedure to be accurate, so the night before you will not be able to eat or drink anything after midnight. Your physician may give you other specific instructions.